Today I found out the red juice in raw red meat is not blood. Nearly all blood is removed from meat during slaughter, which is also why you don’t see blood in raw “white meat”; only an extremely small amount of blood remains within the muscle tissue when you get it from the store. So what is that red liquid you are seeing in red meat? Red meats, such as beef, are composed of quite a bit of water. This water, mixed with a protein called myoglobin, ends up comprising most of that red liquid. In fact, red meat is distinguished from white meat primarily based on the levels of myoglobin in the meat. The more myoglobin, the redder the meat. Thus most animals, such as mammals, with a high amount of myoglobin, are considered “red meat”, while animals with low levels of myoglobin, like most poultry, or no myoglobin, like some sea-life, are considered “white meat”. Myoglobin is a protein that stores oxygen in muscle cells, very similar to its cousin, hemoglobin, that stores oxygen in red blood cells. This is necessary for muscles which need immediate oxygen for energy during frequent, continual usage. Myoglobin is highly pigmented, specifically red; so the more myoglobin, the redder the meat will look and the darker it will get when you cook it. This darkening effect of the meat when you cook it is also due to the myoglobin; or more specifically, the charge of the iron atom in myoglobin. When the meat is cooked, the iron atom moves from a +2 oxidation state to a +3 oxidation state, having lost an electron. The technical details aren’t important here, though if you want them, read the “bonus factoids” section, but the bottom line is that this ends up causing the meat to turn from pinkish-red to brown. Pro-tip: when searching for non-copyrighted pictures for an article, don’t search for “white meat” or really any variation of that on Google Image Search. It is possible for meat to remain pinkish-red all through the cooking if it has been exposed to nitrites. It is even possible for packagers, through artificial means, to keep the meat looking pink, even after it has spoiled, by binding a molecule of carbon monoxide to produce metmyoglobin. Consumers associate pink meat with “fresh”, so this increases sales, even though the pink color has little to do with the freshness of meat. Pigs are often considered “white meat”, even though their muscles contain a lot more myoglobin than most other white meat animals. This however, is a much lower concentrate of myoglobin than other “red meat”, such as cows, due to the fact that pigs are lazy and mostly just lay around all day. So depending on who you talk to, pigs can be considered white meat or red meat; they more or less sit in between the two classifications. Chickens and Turkeys are generally considered white meat, however due to the fact that both use their legs extensively, their leg muscles contain a significant amount of myoglobin which causes their meat to turn dark when cooked; so in some sense they contain both red and white meat. Wild poultry, which tend to fly a lot more, tend to only contain “dark” meat, which contains a higher amount of myoglobin due to the muscles needing more oxygen from frequent, continual usage. White meat is made up of “fast fibers” that are used for quick bursts of activity. These muscles get energy from glyocogen which, like myoglobin, is stored in the muscles. Fish are primarily white meat due to the fact that they don’t ever need their muscles to support themselves and thus need much less myoglobin or sometimes none at all in a few cases; they float, so their muscle usage is much less than say a 1000 pound cow who walks around a lot and must deal with gravity. Typically, the only red meat you’ll find on a fish is around their fins and tail, which are used almost constantly. Some fish, such as sharks and tuna, have red meat because they are fast swimmers and are migratory and thus almost always moving; they use their muscles extensively and so they contain a lot more myoglobin than most other sea-life. For contrast, the white meat from chickens is made up of about .05% myoglobin with their thighs having about .2% myoglobin; pork and veal contain about .2% myoglobin; non-veal beef contains about 1%-2% of myoglobin, depending on age and muscle use. The USDA considers all meats obtained from livestock to be “red” because they contain more myoglobin than chicken or fish. Beef meat that is vacuum sealed, thus not exposed to oxygen, tends to be more of a purple shade. Once the meat is exposed to oxygen, it will gradually turn red over a span of 10-20 minutes as the myoglobin absorbs the oxygen. 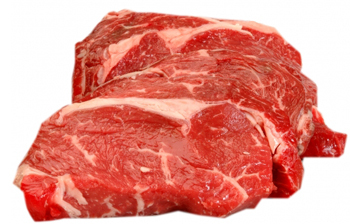 Beef stored in the refrigerator for more than 5 days will start to turn brown due to chemical changes in the myoglobin. This doesn’t necessarily mean it has gone bad, though with this length of unfrozen storage, it may have. Best to use your nose to tell for sure, not your eyes. Before you cook the red meat, the iron atom’s oxidation level is +2 and is bound to a dioxygen molecule (O2) with a red color; as you cook it, this iron loses an electron and goes to a +3 oxidation level, and now coordinates with a water molecule (H2O). This process ends up turning the meat brown. On second thought, I may get punched! Nitrite soaking of meat is one of the oldest myoglobin fixes. The procedure was discussed at length in several German chemistry journals as early as the 19th century. The structure of MbNO2 was one of the first bioinorganic structures solved and continues to this day to be a system of great interest. Nitrites and nitrosyls are important biological signaling molecules. While nitrite soaking of meat may improve their sale value, high concentrations of nitrites should be avoided. Foods like packaged pepperoni (while delicious) do contain very high amounts of nitrite. When proteins are exposed to heat, thermal degradation occurs and the free nitrite groups will attach, forming nitrosamines. Nitrosamines have been implicated in pancreatic cancer (among other types). Strangely, nitrite should theoretically kill any organism whose respiration is dependent on Mb/Hb systems, since nitrite is favorable to oxygen. This means that nitrite displaces oxygen from myoglobin and hemoglobin at a very fast rate. The reversal of this process, believed to be mediated by cd1 nitrite reductase is the subject of a great deal of study in biochemistry (on experimental, analytical and theoretical fronts). Yi, J.; Heinecke, H.; Tan, H.; Ford, P.; Richter-Addo, G. The Distal Pocket Histidine Residue in Horse Heart Myoglobin Directs the O-Binding Mode of Nitrite to the Heme Iron. J. Am. Chem. Soc. 2009, 131, 18119-18128. Visser, S. Density functional theory (DFT) and combined quantum mechanical/molecular mechanics (QM/MM) studies on the oxygen activation step in nitric oxide synthase enzymes. Biochem. Soc. Trans. 2009, 37, 373-377. Chen, H.; Hirao, H.; Derat, E.; Schlichting, I.; Shaik, S. Quantum Mechanical/Molecular Mechanical Study on the Mechanisms of Compound I Formation in the Catalytic Cycle of Chloroperoxidase: An Overview on Heme Enzymes. J. Phys. Chem. B 2008, 112, 9490-9500. Cho, K.; Hirao, H.; Chen, H.; Carvajal, M.; Cohen, S.; Derat, E.; Thiel, W.; Shaik, S. Compound I in Heme Thiolate Enzymes: A Comparative QM/MM Study. J. Phys. Chem. A 2008, 112, 13128-13138. Marti, M.; Crespo, A.; Bari, S.; Doctorovich, F.; Estrin, D. QM-MM Study of Nitrite Reduction by Nitrite Reductase of Pseudomonas aeruginosa. J. Phys. Chem. B 2004, 108, 18073-18080. Copeland, D.; Soares, A.; West, A.; Richter-Addo, G. Crystal structures of the nitrite and nitric oxide complexes of horse heart myoglobin. J. Inorg. Biochem. 2006, 100, 1413-1425. Cho, K.; Derat, E.; Shaik, S. Compound I of Nitric Oxide Synthase: The Active Site Protonation State. J. Am. Chem. Soc. 2007, 129, 3182-3188. Sundararajan, M.; Hillier, I.; Burton, N. Mechanism of Nitrite Reduction at T2Cu Centers: Electronic Structure Calculations of Catalysis by Copper Nitrite Reductase and by Synthetic Model Compounds. J. Phys. Chem. B 2007, 111, 5511-5517. Crespos, A.; Marti, M.; Kalko, S.; Morreale, A.; Orozco, M.; Gelpi, J.; Luque, J.; Estrin, D. Theoretical Study of the Truncated Hemoglobin HbN: Exploring the Molecular Basis of the NO Detoxification Mechanism. J. Am. Chem. Soc. 2005, 127, 4433-4444. Gladwin, M.; Grubina, R.; Doyle, M. The New Chemical Biology of Nitrite Reactions with Hemoglobin: R-State Catalysis, Oxidative Denitrosylation, and Nitrite Reductase/Anhydrase. Accts. Chem. Research. 2009, 42, 157-167. Drago, R. Physical Methods For Chemists, 2nd ed. ; Saunders College Publishing: Gainesville, 1977. Voet, D.; Voet, J.; Pratt, C. Fundamentals of Biochemistry: Life at the Molecular Level, 2nd ed. ; Fitzgerald, P., Ed. ; Wiley: New York, 2007; p 295, 759. Price, C. Geometry of Molecules, 1st ed. ; McGraw-Hill: Boston, 1971. Dyall, K.; Faegri, K. Relativistic Quantum Chemistry, 1st ed. ; Oxford University Press: New York, 2007. Levine, I. Quantum Chemistry, 5th ed. ; Prentice Hall: New Jersey, 2000. Rhodes, G. Crystallography Made Crystal Clear, 2nd ed. ; Academic Press: San Diego, 2000. Skoog, D.; Holler, F.; Crouch, S. Principles of Instrumental Analysis, 6th ed. ; Thomson: Belmont, 2007. Biochemistry and Nutrition, Nuclear and Particle Physics. David R. Lide CRC Handbook of Chemistry and Physics, 71st ed. ; CRC Presss, 1991. Excellent article, and now I have a new bbq fact! One small gripe though – a factoid doesnt mean a small fact; it means something that appears to be a fact but is in fact false. The correct term for a small nugget of trivia is ‘factlet’. The Pro-Tip was bloody (or water-hemoglobinly) hilarious. Seems to me like a contradiction with the explanation given in this article. Am I right? No, not really. Which part do you think is contradicting though? Medium rare steaks are actually preferred over rare steaks when tasted blind, even for people who profess to prefer rare. The reason is that the fat has begun to render, giving you much more beef flavour. Not if the meats are at body temperature, then either can be preferred. I myself hate cooked meat, it’s rather unpalatable. Fully cooked meat is like boot leather, and isn’t very nutritious because the heat has killed most of the important nourishing components, such as B12. It’s always best to have some red or pink in meat. Raw is the most nutritious if people would get over their irrational “ew” factor over raw meat but not raw vegetables and fruits. I think it more so has to do with the low quality of the meat that people often consume. Thank you for educating me! It’ll make it easier for me to swallow juicy meat. This is not wholly true. They do add color to the meat, however there is still blood in a lot of meat. I have MANY times had Chicken that still had blood in it. So, if you say that you never see that, I have to question your experience. The reality is probably that it has some of both. In fact, if it is ONLY the protein coloring, then your steak reaching 120 degrees should get rid of that coloring. I tend to make my steaks medium rare (and contrary to what someone else said, do not prefer them medium, because food is also about texture and I do not like the texture when it is medium or well done), and not only is the meat still pinkish, but sometimes if it is more on the rare side, there is definitely still blood. And, it has a distinct iron taste. Also, it really doesn’t matter who you talk to, as far as whether pigs are red meat or not. Pigs are effectively red meat. Mammals = red meat. Fowl and Fish are not mammals. Red meat vs. white meat is a silly distinction anyway. Fish meat is even more different from both. Claiming that pigs are red meat or white meat depending on who you talk to is as relevant as claiming that tomatoes are fruits or vegetables depending on who you talk to. Fruits and vegetables have distinct biological classifications, and fruits tend to have much more sugar and have other big differences from most vegetables. Tomatoes are fruits. Tomatoes are fruits if speaking botanically, they are vegetables if speaking culinarily. The list of botanical fruits that are considered vegetables when cooking also include eggplant, cucumbers, okra, squash, peppers, olives, and avocados, amongst others. Another example of a pedantic distinction would be that strawberries, blackberries, and raspberries are not botanically fruits, much less berries, but are considered to be both when in the kitchen and from a nutritional standpoint. Peanuts and cashews are not nuts to a botanist either. Sunflower seeds still in their shells are simply dried fruit. It keeps going, but I hope that the point has been made. We only need to be technical when speaking technically, in a scientific setting. In our everyday lives, clarity of meaning is far more important than pseudo-intellectual nitpicking. Pig: the original pink meat. To bad “myoglobin” is not quite as productive as “blood”. “Myoglobinny”? “Myoglobinning”? This may sound like a dumb question, but when eating raw/rare red meat, do we actually absorb the oxygen in the myoglobin from the meat? Pink doesn’t mean fresh meat? But doesn’t oxidation happen when organic matter is exposed to air? So the longer the meat is exposed to air, the less fresh it is, and it’s less pink as well. That’s makes sense to me but maybe I missed something. Cut open an apple or peel a banana and oxidation makes it turn brown. when you break banana without a knife is better than with knife ? why ?